The ruling Democratic Progressive Party (DPP) will have a two-person race in its upcoming chairman by-election after two heavyweight members signed up to run for the post by the registration deadline on Friday, according to the DPP. You Ying-lung (游盈隆), chairman of the Taiwan Public Opinion Foundation, completed his registration Friday morning after paying a NT$1.5 million (US$48,606) fee. Cabinet Secretary-General Cho Jung-tai (卓榮泰) followed, registering his bid in the afternoon. Registration for the by-election opened on Monday and continued through Friday. Two other party members had registered earlier, but later changed their mind about running in the by-election. 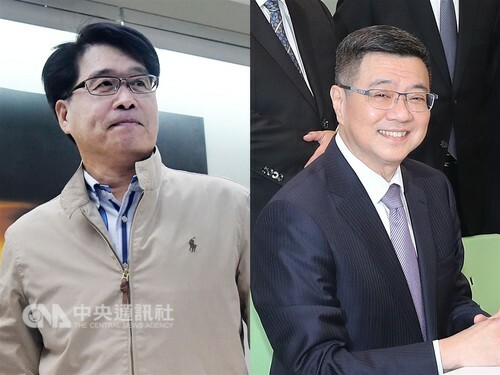 Kuo Tai-ling (郭泰麟), who was deputy chief of the now-defunct Kaohsiung County, completed his registration on Thursday, but withdrew his bid on Friday, saying You or Cho will be more suitable than he to serve as the DPP chairman. On the second day of registration, Chen Shu-lin (陳樹霖), a DPP member, registered his bid, but withdrew it about one hour later. So the by-election will become a two-man race. The Central Executive Committee of the DPP is scheduled to review the qualification of You and Cho on Dec. 19 before the two candidates have a draw on Dec. 20 to pick their candidate number. The two candidates will hold a televised presentation to present their individual platforms as the DPP chairman on Dec. 30. The by-election has been scheduled for Jan. 6 after President Tsai Ing-wen (蔡英文) announced her resignation as chairwoman of the party on Nov. 24 to take responsibility for the ruling party's crushing defeat in the local government elections held that day. In the elections, the DPP won only six of Taiwan's 22 city mayor and county magistrate positions, while the opposition Kuomintang (KMT) grabbed 15. That meant the DPP had lost more than half of its 13 posts, while the KMT gained more than double the 6 seats it had held. Before taking the helms as the chairman of the Taiwan Public Opinion Foundation, You, a scholar who studies voting behavior, served as the deputy head of the Mainland Affairs Council and the secretary general of the Straits Exchange Foundation during the 2000-2008 tenure of former President Chen Shui-bian (陳水扁). You, who announced his bid for the DPP chairman on Wednesday, said he hopes his participation in the by-election will show the position is not decided by party fractions, but by direct election by all party members. For his part, Cho, who has served in several government posts and was a lawmaker from 1999-2004, got support from a group of young DPP members to run for the party chairmanship. The group was led by Taoyuan Mayor Cheng Wen-tsan (鄭文燦). Cheng described Cho as a "big brother to the younger generation" when he accompanied the candidate to show up at the party headquarters for registration. The by-election will be held between 8 a.m. and 5 p.m. on Jan. 6. The results will be formally announced on Jan. 9.